At DataCamp, we’ve been working on a improved way of creating content. DataCamp’s new Teach app is closely linked with GitHub, the popular web-service where you can collaborate on Git Repositories. 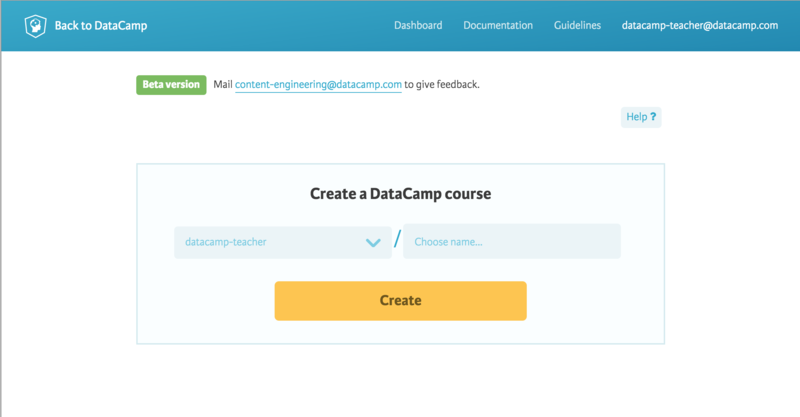 To make creating and maintaining courses as easy as possible, the DataCamp Teach app can automatically convert a GitHub repository in a DataCamp course. 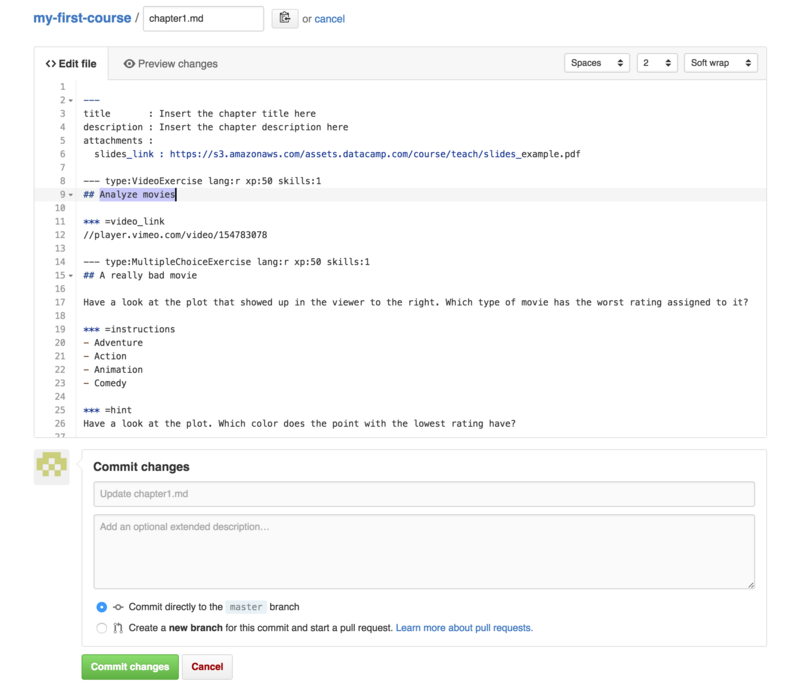 This is similar to how continuous integration tools such as Travis CI and Jenkins work: simply push changes to your GitHub repository, and the changes are automatically reflected in the DataCamp app. This blog tutorial walks you through the different steps to create your own interactive online course on www.DataCamp.com. Next to the post you can also have a look at the complementary screencast below. If you want to take a deep dive into DataCamp's documentation, head over to www.datacamp.com/teach/documentation. Teaching Data Science has never been easier! Start by browsing to www.datacamp.com/teach. 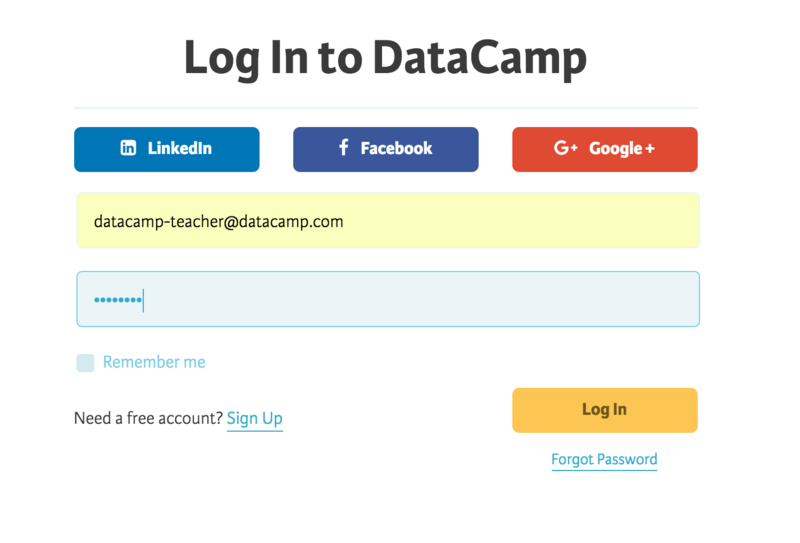 If you’re not logged in you will be redirected to the DataCamp login page, where you can continue using your DataCamp credentials. If you don’t have a DataCamp account yet, you can create a new one by following the Sign Up link. Once logged in to DataCamp, you will immediatly be asked to link your GitHub account. 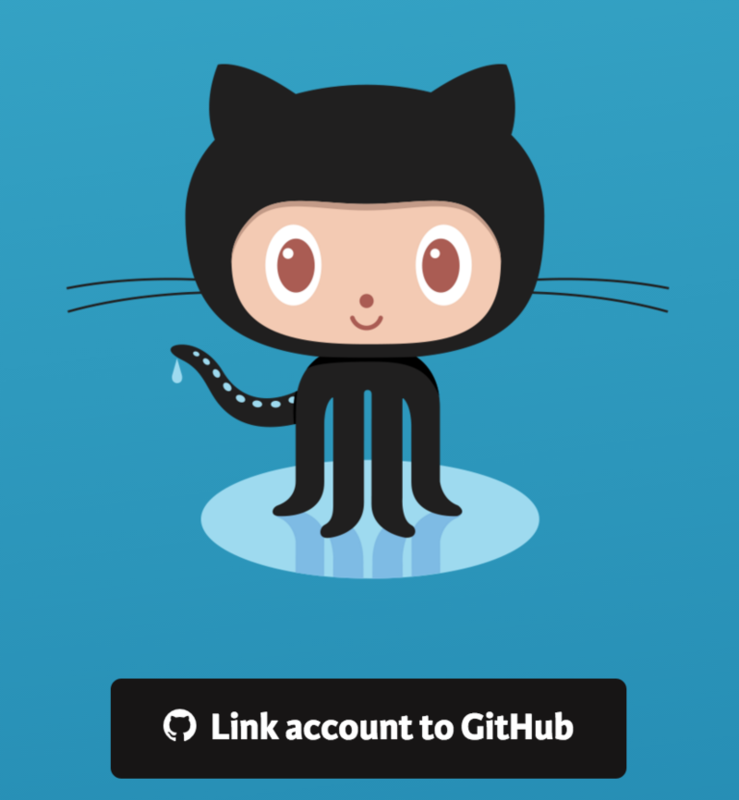 Press the Link account to GitHub button and log in on your GitHub account. You might have to give access to DataCamp so that your repositories can be read. After linking your GitHub account, you will be redirected back to start creating a course. That’s all, wait a few seconds and the course will be added to your GitHub repositories and linked with DataCamp. Once the course is created, it will appear in your linked courses section. Course title: clicking the course title will redirect you to the course page on DataCamp. After creating a new course, you might need to click the Refresh link before the course title will become available. Github icon: browse to the GitHub page of the repository you created. Refresh: this will refresh the course build information, showing the latest builds. Show details: show the details of a build. 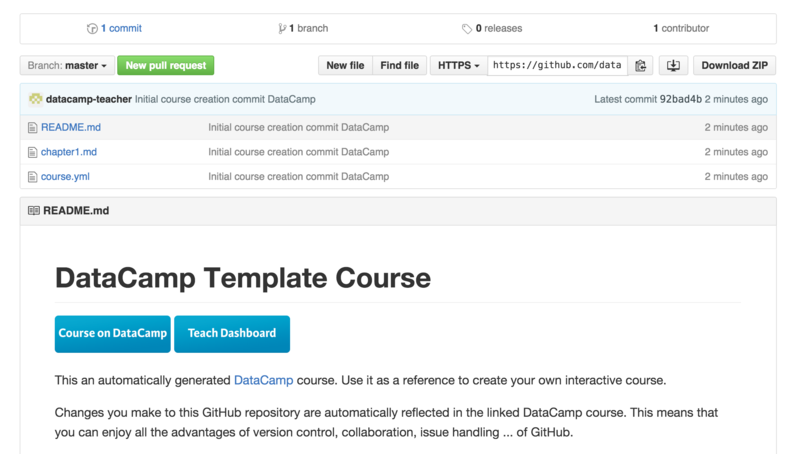 Unlink: remove the association between the GitHub repository and the DataCamp course. After removing this link, changes to the repository on GitHub will no longer affect the course on DataCamp. Show more builds: show older course builds. In the course repository box, you can have a look at the recent build attempts of your course. Succesful builds will be annotated with a green border. You can show the details of a specific build by pressing on Show details. Pressing Show details will reveal some extra information, this is especially useful if you try to find out why your build failed. Next, let’s make some changes to our brand new course. Using DataCamp Teach, this becomes a piece of cake. First we click on the GitHub icon in the course repository box to browse to the GitHub page of our new course. Say you want to edit Chapter 1 of your course. In this case you can click on chapter1.md on the GitHub page and use the standard GitHub editor to start editing the file. In this example we’ve changed the title of the first VideoExercise to Analyze movies. You can name this however you want. If you want some more information about the internal structure of these markdown files, you can use the documentation at this page. Commit your change on GitHub, but watch out: don't forget to add an informative commit message. Afterwards, you go back to the DataCamp Teach application, press the Refresh button and have a look at the details of the new build attempt. Everything seems to have passed! Let's have a look at the course on DataCamp, click on the Course title of the course you just updated. Nice, your changes on GitHub have automagically been updated on the DataCamp site. Editing courses has become easier than ever. Of course you're not restricted to the GitHub UI to edit courses, any interface which can push to GitHub will do.